In a bid challenge to big players such as Skype, Viber has announced Viber for Mac and PC so here’s our Viber for Mac review. Viber works on OS X 10.7 Lion and above and features instant messaging and voice calls and syncs your messages across all of its mobile platforms i.e. BlackBerry, Windows Phone, iOS and Android. When you first download Viber, you’ll need to have your account details handy or setup a new account. You must ensure that you have the latest version of Viber installed on your mobile device or else the Viber for Mac activation process may not work. If you already have an account, you’re asked to enter the mobile phone number on which you already have Viber installed. Note that you do not have to add the international country code or “+” symbol. Simply select the country where you live so that the correct flag shows next to the number. Then just type the number normally as if you were calling a friend or dialing the number in your country. If you are still having problems and your mobile number begins with a “0”, try dropping the “0” when you enter the number. Viber then sends a 4 digit activation code to your mobile which you then use to activate Viber for Mac. Viber for Mac has a slick interface that’s very similar to Skype and Apple’s Messages for Mac. Contacts are on the left side of the interface and chats are on the right. You can have instant messaging conversations and make Mac-to-Mac video and voice calls. However, unlike Skype, there’s no conference calling feature and you can’t make video calls to mobile. The Mac to Mac video function is also in Beta so may be unstable. Call quality and video quality is generally very good and comparable with Skype. Viber for Mac also supports stickers so you can liven-up conversations with your friends with fun emoticons. There are also some basic preferences that you can tweak. From the start, Viber opens automatically when you boot your Mac so you might want to deactivate this. 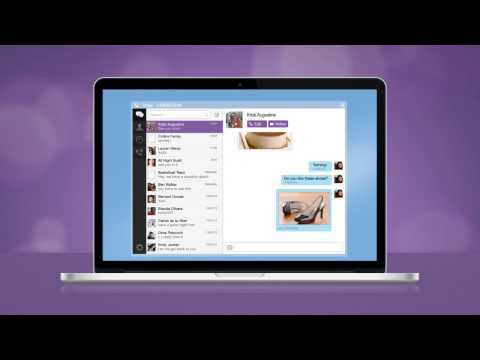 Viber for Mac – Better than Skype, Line or Messages? Viber for Mac faces tough competition in the form of Skype, Line for Mac and of course, Apple’s Messages. However, it has a huge user base and desktop to mobile messaging is still very much an evolving market. Viber for Mac will definitely be one to watch as this market evolves. Download Viber for Mac and find out for yourself how it compares. Viber for Mac works on all Macs running Lion or above including Macbook, Mac Pro and Mac Air. If you want to see Viber for Mac in action, check out the Viber for Desktop video.